”TALON” Mobile Robot – FOP Shvachko V. V.
The TALON robot is a small tracked military system, designed by the Foster-Miller company (USA) for wide range of missions (from reconnaissance to combat). It can move through sand, water, and snow as well as climb stairs. The robot weighs less than 45 kg (or 27 kg for the Reconnaissance version). Its cargo bay accommodates a variety of sensor payloads. The robot is controlled through a two-way radio or a Fiber-optic link from a portable or wearable Operator Control Unit (OCU). The TALON transmits the video data (in color, black and white, infrared, and/or night vision) to its operator, who may be up to 1,000 m away. It can run off lithium-ion batteries for a maximum of 7 days on standby independently before needing recharging. It has an 8.5 hour battery life at normal operating speeds: 2 standard lead batteries are providing 2 hours each and 1 optional lithium-ion battery is providing an additional 4.5 hours. The TALON can also withstand repeated decontamination allowing it to work for long periods of time in contaminated areas. Regular TALON It carries sensors and a robotic manipulator, which is used by the U.S. Military for explosive ordnance disposal and disarming improvised explosive devices. lighter due to the absence of the arm, for reconnaissance missions. SWORDS TALON The Special Weapons Observation Reconnaissance Detection System is a weaponized version being developed for the US Army. The robot is composed of a weapons system mounted on the standard TALON chassis, it is purposed for small arms combat and guard roles. HAZMAT TALON It uses chemical, gas, temperature, and radiation sensors that are displayed in real time to the user on a hand-held display unit. The TALON has been deployed in military service since 2000. It was used initially for the Explosive Ordnance Disposal (EOD) and Improvised Explosive Device Disposal (IEDD). Additionally, the robot has demonstrated the ability to shoot precisely – it is not autonomous, but instead has to be controlled by a soldier using a small console to remotely direct the device and fire its weapons. Also TALON was involved in search and recovery. 1. Foster-Miller TALON. – Mode of access: http://en.wikipedia.org/wiki/Foster-Miller_TALON. 2. Swords. – Mode of access: http://ru.wikipedia.org/wiki/Swords. 3. TALON Small Mobile Robot. – Mode of access: http://www.globalsecurity.org/military/systems/ground/talon.htm. 4. Foster-Miller. – Mode of access: http://en.wikipedia.org/wiki/Foster-Miller. 5. Foster-Miller TALON. – Mode of access: http://www.youtube.com/watch?v=yliThCy3RxY. 6. Foster-Miller Talon Bomb Disposal Robot . – Mode of access: http://www.youtube.com/watch?v=UpreV45c2l8. 7. 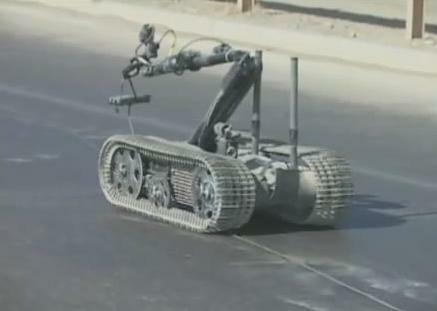 Talon Robot in Iraq. – Mode of access: http://www.youtube.com/watch?v=6fPokv1RG9A. 8. The Inside Story of the SWORDS Armed Robot “Pullout” in Iraq: Update // Popular Mechanics. – Mode of access: http://www.popularmechanics.com/technology/gadgets/4258963. 9. Talon Specifications // Unmanned vehicles for saving lives!… – Mode of access: http://roboinfo.wordpress.com/category/talon/.